The North Mills River is another great stretch near Asheville. Located between Asheville and Brevard this river gives you another great option in this area. This is a scenic river with its boulders, narrow sections and trees bordering the river. These narrow sections don't present any casting difficulties, but you will find yourself using a roll cast or flip cast more than an overhead cast. 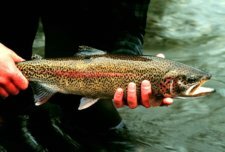 There are many fly fishing guides and fly fishing lodges available. This is some of the best trout fly fishing in North Carolina. The North Mills has nice runs and pools that make it a perfect trout stream. You can have great success using streamers and wooly buggers in the runs, and small nymphs and dry flies in the pools. The river gives you many different types of fishable waters which makes it great for every angler. You will find a nice variety of trout in this Blue Ridge Mountain stream. There are nice Brown's, Rainbow's and Brook trout for the taking. The fish are normal size for the type, with not many fish in this stream over 16". Pay attention to the delayed harvest rules that apply to this stream. Check out the fishing regulations before fishing. You can hit the river near the Mills Recreation parking area, and park for a small fee, or drive down forest road 479 and head towards the reservoir for Brevard. Drive through the campground and take the first left and head to a small parking area. There is a small gated road that runs alongside the mountains and leads down to a small reservoir. Access to the river can also be had near the spot where state road 1345 meets state highway 191. The signs will point the way from there to the recreation area. Plan on hiking into the river because the river is below the parking area and some sections will be steep. This is a great spot to catch hatchery fish so it is worth a little physical effort. Leave North Mills River page and return to North Carolina page.